Calling creatives of all stripes who have an inquisitive mind, an innovative approach and a desire to collaborate to participate in the 2011 Splendid program. Splendid is open to artists (under 30 years or in the first 5 years of their practice) who work in the visual arts, theatre, dance, design, installation, architecture, digital media, sound, text and other creative pursuits. You may want to.. forward to a friend. We are seeking the next generation of young and emerging artists to participate in a 3 week intensive residency to dream up ideas and create work for festival audiences. Our program offers participating artists opportunities to work collaboratively in a dynamic environment that encourages critical thinking and experimentation. &nbsp;“Splendid is attractive because you are dreaming up ideas while having to apply them to a real life rampaging rock context.” – Willoh S. Weiland, Splendid Artist 2010. The Splendid program includes a residential Arts Lab, mentorship and opportunities to tour your work to major festivals around the world. Collaborations and ideas conceived in the Arts Lab may enter a 4 month consultation and development period. 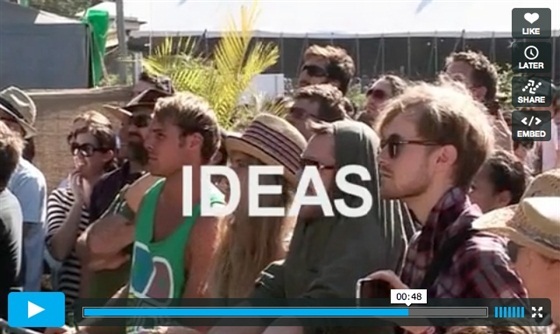 Project proposals will then be submitted for presentation at Splendour in the Grass 2012. The Lab will be facilitated by leading local and international artists including Fernando Llanos (Mexico – video art), David Clarkson (innovative physical theatre), Natalie Jeremijenko (USA – environmental art & design), Craig Walsh (site-specific projections), Paul Gazzola (Berlin – collaborative practice), Técha Noble, The Kingpins (art direction and performance) and more. Attend the Arts Lab from Monday 25 July to Friday 12 August, 2011. Participate in artist talks and a festival symposium. Receive tickets to Splendour in the Grass 2011. Submit a concept proposal for a new work to be commissioned by Splendour in the Grass. Be given a fee to cover accommodation, travel and incidentals. Still unsure of what we’re about? Come along to one of our briefing sessions. Meet people who have been through the Splendid program. We’ll let you know what Splendid is, why we do it and what we’re looking for from artists around the country. Find out when we’re visiting your city HERE. The 2011 Splendid Arts Lab residency will take place over 3 weeks in Lismore, NSW and the surrounding (rainbow) region and will include attendance at Splendour in the Grass at Woodfordia, QLD. “Different regions inspire people in different ways and to escape the city and work in the country where the stories are different and the landscape is bigger can often be an inspiring change for artists.”&nbsp;- Julian Louis, Artistic Director of NORPA (Northern Rivers Performing Arts) and producing partner of Splendid. 1. Complete the Splendid 2011 Application Form. Download it HERE. 2. Answer the 3 Splendid questions. 3. CONTACT US if you need help or more information about completing your application. Click HERE to watch the above promo.